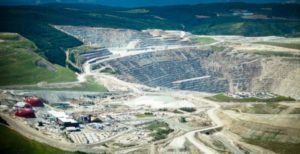 VANCOUVER – The third quarter financial performance of Teck Resources included a $1.3-billion profit attributable to shareholders. Compare that to the same profit during Q3 2017 of $548 million. However, adjusted profit attributable to shareholders declined to $466 million or $0.81 per share in the recent quarter compared to $605 million in the same quarter a year earlier. Gross revenue for Q3 2018 was $3.2 billion compared to $3,075 for the same quarter of 2017. Quarterly production included 6.4 million tonnes of metallurgical coal, 2.5 million barrels of bitumen, 72,000 tonnes of copper, 180,000 tonnes of zinc in concentrate, and 74,000 tonnes of refined zinc. President and CEO Don Lindsay said operations continued to perform well, although the price for metallurgical coal, copper and zinc declined during Q3 2018. The third quarter was marked by several highlights. Plant performance at Fort Hills exceeded expectations. The Quebrada Blanca expansion in Chile received regulatory approval. The sale of two-thirds interest in the Waneta Dam to B.C. Hydro grossed $1.2 billion cash, and that allowed Teck to pay down approximately $1.3 billion of near term debt; the balance is now $4.94 billion. Teck was also included on the Dow Jones Sustainability World Index for the ninth year in a row. More details from the third quarter can be found at www.Teck.com.